Tosa Maidan falls in district Budgam of Central Kashmir its 45 km from Srinagar to Drung (tehsil Khag). This distance can be traversed by vehicle. From Drung afterwards, the path to Tosa Maidan is trekked on foot or on a horse. It is a distance of 10 to 15 Kms.Tosa Maidan is not only famous as a pasture but also for its historical background. 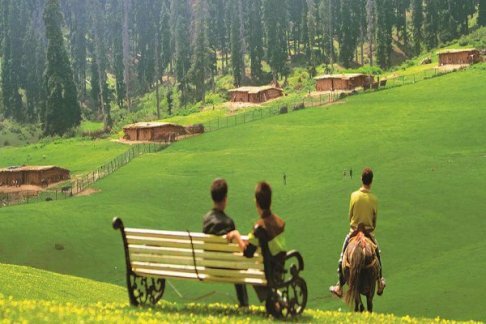 Bounded by dense forests, it is situated about 10 kms from Khag in the mountains of the Himalayan range. After crossing the upper mountain reaches of Drang, Zakhora and other small villages, one reaches the pasture of Tosa Maidan. It is said that Tosa Maidan is one of those pastures which the shepherds of other neighbouring countries also used to visit in ancient times. The Mughals used to go to Poonch using this route. It is said that they had constructed a seven-storeyed building – Dam-Dam - here. The Basmai Gali(13,000 ft) is the pass which leads into Tosa Maidan. Another pass - Poonch Gali - on its right side leads to the valley of Poonch. This pass was deemed to be the safest, easiest, and nearest to reach Punjab in ancient times. From here, a path also leads to Nilnag. Tosa Maidan is the largest pasture in its surrounding areas, 3 miles in length and 1.5 miles in width. Sky-touching deodars fence this pasture presenting a view of a green carpet in summer. During the summer, the camps of the Gujjar community and shepherds with theirgrazing sheep in the pastures present a riveting picture. Also, the fragrance of wild flowers refreshes the whole environment..
Tosa Maidan falls in district Budgam of Central Kashmir. One has to travel 45 km from Srinagar to Drung (tehsil Khag). This distance can be traversed by vehicle. From Drung afterwards, the path to Tosa Maidan is trekked on foot or on a horse. It is a distance of 10 to 15 Kms..
You set up a base camp at Dam Dam. Places to trek include Chinamarg, Khilanmarg and Bandsar. Tosa Maidan is surrounded by various other meadows like Watadar, Hafwas, Kadlibal, Nagnibal, Duriyaan etc. The trek will take 10 to 12 hours and you can return to base in the evening if you leave early morning. Towards the west is Bandsar- source of river Sokhnag..
Once labelled as ‘death meadow’. Tosa Maidan was leased to the army in 1964 for setting up an artillery firing range for 50 years. The lease ended on April 14 2014. The place has now been cleared and declared safe..
(October to April) are chilly and snow bound. The minimum mercury level goes below sub zero levels and the region mostly covers receives fresh snowfall. The views of the landscape are excellent with snow covered hilly terrains. (May to Aug) are warm and pleasant. The temperature in this hilly region ranges between 15°C and 25°C. Intermittent showers are seen during this period. There is no snowfall but snow can be found on high altitudes. .